Yesterday, I got a email, he said he want a tool to sign PDF in ubuntu. At first, I decided to develope one, then I thought I have downloaded a this kind tool before, so I think just need tell him this one is ok. And if needed, I can compile it with GCJ(of course just command line), just like pdftk, do not need JVM. I have a problem: I want to generate a pdf, then I want to apply a digital signature to it. I need a tool very similar to pdftk to do this. Can you suggest / give some advice on any of the following? * Is there anything out there already that does this, particularly that works on ubuntu? * If not, how much difficulty is involved in implementing the ability to digitally sign a pdf into a command line application? * Is there any documentation you would suggest as a starting point? 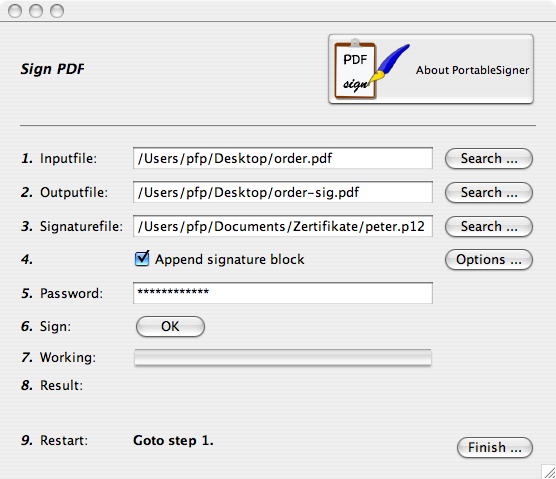 PortableSigner is a signing (with X.509 certificates) program for PDF files. 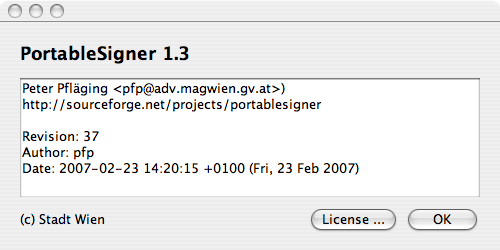 It’s plattform independent and runs (tested) under Windows (2000, XP, …), Linux and Mac OS X. * GUI Desktop Modes : Graphical frontend to sign single documents. 1. Select your inputfile (the last used file is preselected). 4. It is possible to attach a signature block as last page of the document. 5. The password of your PKCS#12 file. Here’s the “About …” dialog. please include the version info in every request to me! The switch “-n” turns the GUI off. In all other cases the GUI is invoked to support macro mode calling!